....a load off my mind! I am delighted to announce that, as of just a couple of weeks ago, I purchased the shareholding of our US division at Straightpoint Inc., which means that the global offering will be more streamlined under the new combined ownership of our worldwide offices. Along with the ownership change, Straightpoint Inc has moved to new premises, just minutes away from the previous office – click here for our new contact details. Business resumes as normal, and John Molidor and Jenifer Wolfe continue to be your contacts in the US. I would like to thank Paula and Richard Sharpe for their commitment, hard work and for building up the US business so successfully over the years. As Straightpoint continues to grow, I know how important it is to have the right structures and staff in place to keep the business running as smoothly and efficiently as possible. In the previous blog, I welcomed Richard Woollett as our new global Financial Controller. He is now joined by two additional members to our management team; Alfie Lee, Operations Director and Roshan Divakaran, Design Engineer. Plus, I also welcome several young apprentices to the company too. 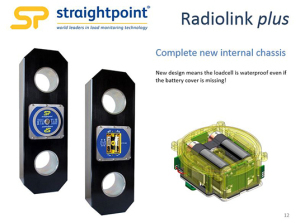 Straightpoint’s 12t Loadlink Plus™ was used by Larkin Eng Services Ltd to load test a weather station’s lifting points, which is being used in Europe’s first commercial floating offshore wind measurement campaign. The weather station’s lifting points were proof tested to check the greatest load that can be applied without straining them beyond the elastic limit, ensuring the weather station could be safely lifted and transported to the DONG Energy and FLiDAR offshore wind measurement campaign in the Irish Sea. UK company Bickers Lifting lowered three brand new Mercedes GLA-Class SUV 189-metres below ground in the Winsford Rock Salt Mine in Cheshire as part of a press launch, to take the cars as far off the beaten track as possible. Bickers designed, fabricated and tested the rig used for the lowering. 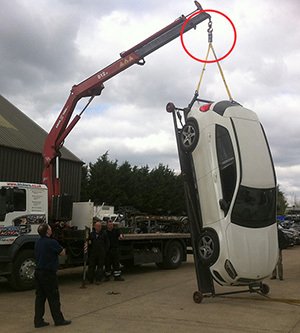 As the shaft was very limited in size, the cars had to go down vertically – a Straightpoint loadcell was used to give Bickers accurate weight readings throughout the process. 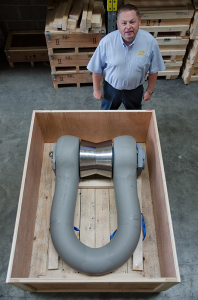 Ever wondered what a 1000t shackle looks like?! This monster was ordered by our Singapore distributors Intermarine for use in the shipping industry. Gamal Al Motaiam from NTE Projects, our distributor for the Saudi Arabian market, came to visit us recently at our UK office. We spent time discussing new products, support and Gamal also spent some time with our production team learning more about repairs and calibration. 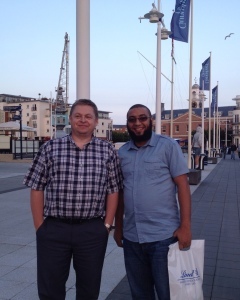 Pictured right: Mr Loadlink and Gamal. Straightpoint Sponsors The Next David Beckham? 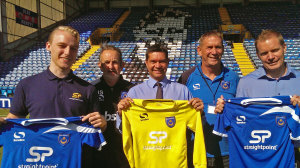 I’m proud to announce that Straightpoint has recently been confirmed as the main sponsor for Portsmouth FC’s under-11 side during the 2014/15 season, with all the sponsorship money going towards the academy, helping to buy the team’s equipment and kits. The team consists of players who have been scouted from the local area and selected to play for the academy’s elite programme, where potentially the next ‘David Beckham’ could be spotted! I recently asked our video company to come up with a new company video – a shorter version, which will be uploaded to our website; plus a longer version which I’ll take with me to meetings and exhibitions. Here’s a sneaky peak of the shorter video before it’s uploaded to our website – I’d love to know what you think – send me an email with your thoughts!